The Internet of Things (IoT) suffers from a lack of interoperability across platforms. As a result developers are faced with data silos, high costs and limited market potential. This can be likened to the situation before the Internet when there were competing non-interoperable networking technologies. The Internet makes it easy to develop networked applications independently of those technologies. W3C is seeking to do the same for the Internet of Things. To achieve this goal, we need platform independent APIs for application developers, and a means for different platforms to discover how to inter-operate with one another. The approach we are taking is based upon rich metadata that describes the data and interaction models exposed to applications, and the communications and security requirements for platforms to communicate effectively. A further aspect is the need to enable platforms to share the same meaning when they exchange data. We are therefore seeking to enable expression of the semantics of things and the domain constraints associated with them, building upon W3C's extensive work on RDF and Linked Data. Learn more about the Web of Things at W3C. The Web of things seeks to counter fragmentation of the IoT through metadata and APIs, building upon W3C’s framework for linked data. We seek to simplify application development, and enable easy integration across IoT platforms and application domains. To help with reaching out to stakeholders, W3C took part in the Industry of Things World conference in Berlin on 19-20 September 2016, with the support of the W3C German/Austria office. The event attracted nearly 1000 attendees interested in the potential of the IoT for industry. 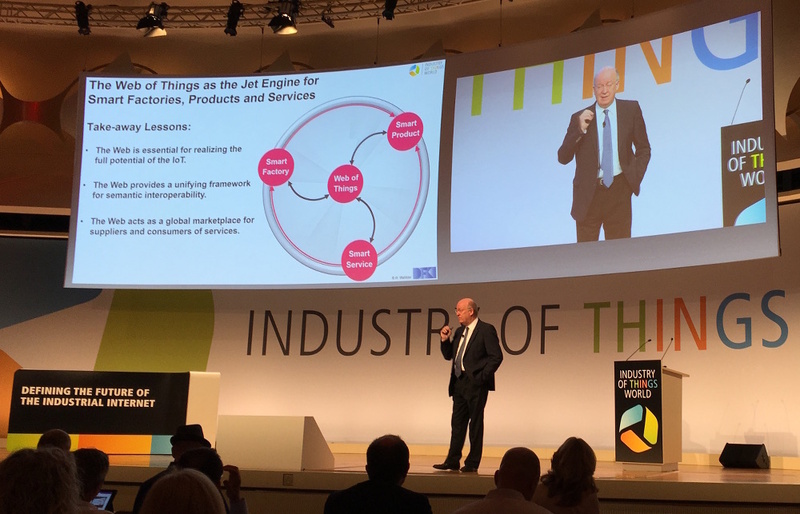 In the opening keynote “Beyond Industry 4.0”, Prof. Dr. Wolfgang Wahlster presented the Web of things as the jet engine for smart factories, products and services, and the interoperability layer above the Industrial Internet. W3C greeted visitors at our stand and handed out introductory materials including the white paper for the Web of Things, and a joint white paper on semantic interoperability prepared by individuals involved in a broad range of organisations. We also ran a workshop “Building the Web of Things – Standards for semantic interoperability and end to end security“. The workshop was organised by Georg Rehm, W3C Office Germany/Austria, and started with an introduction to the Web of things by Dave Raggett. We had two panel sessions. The first on the industrial perspective with Axel Schüßler (Connctd), Colin I’Anson (HPE), Frank Reusch (RWE/Lemonbeat) and Dieter Wegener (Siemens). The second panel session focused on coordination across IoT alliances and standards development organisations with Stefan Hoppe (OPC Foundation), Stefan Weisgerber (DIN) and Thomas Hahn (Plattform Industrie 4.0). 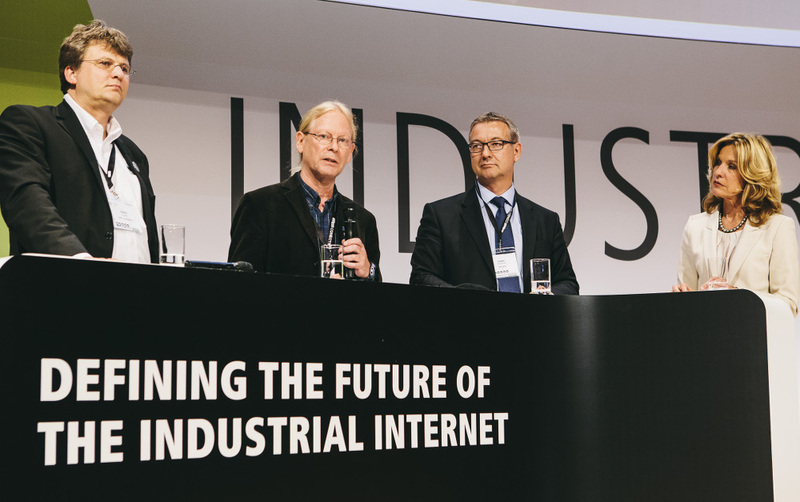 Later, W3C was represented on the conference standardisation panel along with Stefan Hoppe, Global Vice President, OPC Foundation, Dave Raggett, W3C Staff Lead for the Web of Things, and Dieter Wegener on behalf of ZVEI-Führungskreis Industrie 4.0. Our thanks to the moderator, Melinda Crane, Chief Political Correspondent, Deutsche Welle. Dave Raggett, Web of Things Lead, and staff contacts Kazuyuki Ashimura and Yingying Chen.